Is there anything better than seeing the looks on your player's faces as you play the sound of the monster lurking behind the next door? The first look is puzzlement, followed by concern, and then it finally settles into fear. Is it getting louder? Should they stay and fight or turn and flee? Don't just tell your players about the bad guys, let them hear for themselves what creepy thing is about to give them a bad day. Monsters is a macabre folio of boogey men, aliens, and other horrors. Ideally suited for all genre RPG and LARP games. What does that Hell Hound sound like? How about that swarm of giant bugs or that shambling plant creature? "Are you one of those DMs who can mimic a fabulous array of voices and make convincing sound effects during the game? Me, neither. 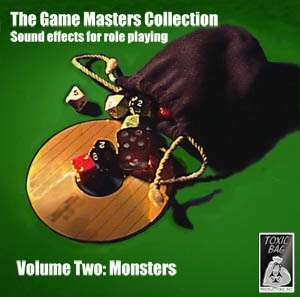 For those of us with a limited vocal range, Toxic Bag Productions has come to the rescue with a series of sound effects for your roleplaying campaign."